McHugh looks at the small cap Russell 2000, and discusses what the market is telling us with this perfect price pattern. The pattern is complete or nearly so, as there has been a fifth wave touch of the rising upper boundary. Prices can rise one more time to that boundary line or crawl along it for a short while, but this pattern is just about finished. The rally from early 2016 is toast. It is over, or just about over. Maybe the top lasts another few months, but in 2017 there will be a trend reversal in small cap prices to the downside. The coming trend reversal (down) will be significant. A crash is coming to small caps. Once it ends, investors will dump stocks with both hands. This is a large price pattern, and that means the spread between the upper and lower boundaries has become huge. 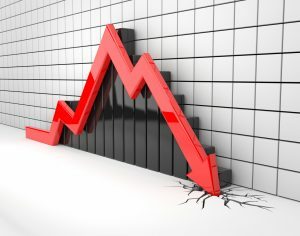 If the length of time for the coming decline is similar to the time each component wave of the pattern took, it means small caps could drop 700 points over a one-year period. Should prices drop below the bottom boundary (below 700), the odds increase that after a corrective bounce, they will head far below 700. Blue chip stocks are headed in the same direction: A massive trend turndown is coming. It could be any minute, within months, or possibly a year. But this reversal will be catastrophic, and it is coming.